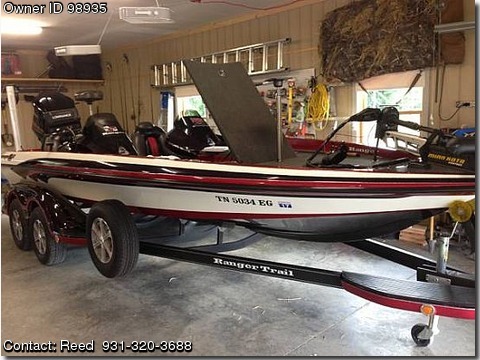 Boat is located in Clarksville,Tennessee.Please contact the owner @ 931-320-three six eight eight or reed3232(at)aol(dot)com....Beautiful ranger boat, garage kept, 4 bank charger, 100 hours on new Yamaha SHO 250hp, motor under original Yamaha extended warranty until march of 2017!! HDS 7 on front, HDS 8 & 12 at console. Will take off $1000 if I keep HDS 12. Excellent condition runs and drives flawlessly. I use 2-3 times per week and wash/wax after every use. Hydraulic jack plate boat is loaded. 36v minn Kota trolling motor, new AGM gel starting/electronics battery, spare ranger tire, minn Kota Talon, ranger hauling cover with ratchet tie downs.